Synopsis : HABRI findings of new economic study on healthcare cost savings associated with pet ownership. 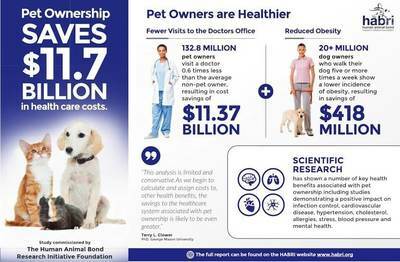 The Human Animal Bond Research Initiative (HABRI) Foundation today announced the findings of a new economic study on the healthcare cost savings associated with pet ownership. The economic analysis, conducted by two researchers from George Mason University, calculated an $11.7 billion savings in U.S. healthcare costs as a result of pet ownership. Founded by Petco, Zoetis, and the American Pet Products Association and supported by a growing number of organizations, the HABRI Foundation maintains the world's largest online library of human-animal bond research and information; to date has funded more than half a million dollars in innovative research projects to scientifically document the health benefits of companion animals; and informs the public about human-animal bond research and the beneficial role of companion animals in society. "There was abundant research to show that pets have a positive effect on our health, but this is the first time that anyone has looked at the impact on the U.S. healthcare system," said study co-author Terry L. Clower, PhD Northern Virginia Chair and Professor of Public Policy at George Mason University's School of Policy, Government, and International Affairs and Director of its Center on Regional Analysis. "Our analysis shows that pet ownership produces meaningful savings for total health care costs in the United States." "Thinking about things that people should do to maintain their health, 'get a pet' belongs on that list," said HABRI Executive Director, Steven Feldman. "When health insurance companies are looking at wellness incentives to keep costs down, pet ownership provides another way for people to stay healthy and save money." The largest savings was determined based on a lower incidence of physician office visits by pet owners as compared to non-owners. According to the study, 132.8 million pet owners in the United States visit a doctor 0.6 times less than the average non-pet owners. The average cost of a physician office visit is $139. Pet owners, in this way, were responsible for saving $11.37 billion in U.S. healthcare costs. Additional savings were calculated for dog owners who walk their dog five or more times a week. While additional health benefits associated with pet ownership have been documented by scientific research, the economists were unable to determine specific cost data associated with those findings. Researchers looked at scientific studies showing a positive impact from pet ownership on infection control, cardiovascular disease, hypertension, cholesterol, allergies, stress, blood pressure and psychological issues, and concluded that further economic data was necessary before healthcare savings could be calculated. According to the report, "because this analysis is limited and conservative, the health care cost savings associated with pet ownership is likely to be even greater." "As HABRI continues to fund human-animal bond research, we will look for ways to measure specific economic variables that measure additional health care cost savings," Clower added.